Tommy Fleetwood and Francesco Molinari created Ryder Cup history and inflicted yet another demoralising defeat on Tiger Woods to inspire Europe to a 10-6 lead at Le Golf National. Debutant Fleetwood and Open champion Molinari combined for their fourth win of the contest on Saturday, a feat never previously achieved by a European pair, and a victory for either in Sunday's singles would complete the first 5-0 record by a European player. Having brushed aside Woods and Patrick Reed 4&3 in the morning fourballs, Fleetwood and Molinari dispatched Woods and Bryson DeChambeau 5&4 in a foursomes session which was shared 2-2 to maintain the home side's four-point cushion. Woods has now lost his last seven foursome or fourball matches in the contest and the 14-time major winner's total of 20 defeats is just one behind the record of Phil Mickelson, who was left out of the entire day's play. "All the records are for nothing if we don"t win the cup back," insisted Molinari, who had not won a match in his two previous Ryder Cup appearances. "There is a job to be done still and we are going to do it." Asked about his partnership with Fleetwood the Italian added: "We are good friends and wanted to play together. We both like the course and we are similar players. It was pretty much written in stone." Europe captain Thomas Bjorn's decision to rest Henrik Stenson and Justin Rose in the morning paid dividends when they combined to beat world number one Dustin Johnson and three-time major winner Brooks Koepka 2&1. And although Sergio Garcia and Alex Noren lost 3&2 to Bubba Watson and Webb Simpson and Rory McIlroy and Ian Poulter went down 4&3 to Justin Thomas and Jordan Spieth, the 10-6 margin gave Europe their biggest lead ahead of the final day since 2006. Fresh from overturning an early 3-1 deficit by winning a foursomes session 4-0 for the first time in the contest's history, the home side came out firing on day two against a seemingly shell-shocked United States side. McIlroy and Garcia survived a nervy finish to lead from the front and beat Koepka and Finau, before Paul Casey and Tyrrell Hatton were a combined nine under par in a 3&2 victory over Johnson and Rickie Fowler. 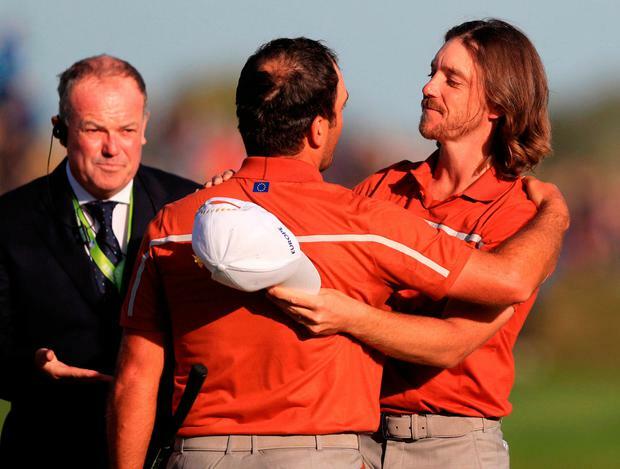 Fleetwood and Molinari, whose win over Woods and Reed was the only European success on Friday morning, then repeated the feat in style on the back of three consecutive birdies from the 11th from Molinari after Woods had somehow dragged the match back to all square. The fourth match was the only one which went against the home side as Spieth and Thomas beat Poulter and Rahm 2&1, despite the European pair being seven under par. However, the eight matches won in a row since trailing 3-0 on Friday morning was the most by any side since the current format was introduced in 1979.